Welcome to the School of Applied Sciences! We are globally recognised, nationally known, locally relevant and personally valued. 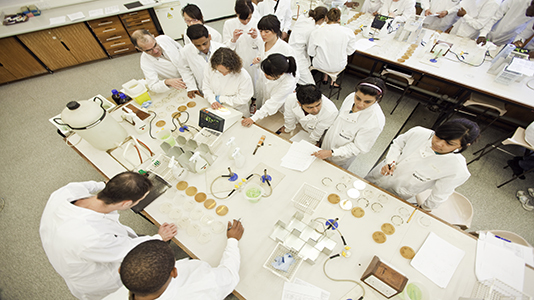 Our vision is to deliver outstanding science education that exceeds our students' expectations, conduct world-leading, research and enterprising knowledge exchange. Recruiting, engaging, developing and retaining the finest staff makes us a great place to work and study. Our courses range from forensic science and psychology to nutrition and sports science. The way we teach combines academic knowledge with fantastic opportunities to apply learning in the real world, setting students on the road to a great career. We organise work placements, talks and seminars in partnership with organisations like the Metropolitan Police Service, the NHS and the British Psychological Society, giving students valuable experience that makes them extremely employable. Our academics are experts in their field, carrying our research on the front line. A large number of them are recognised as Fellows of the Higher Education Academy, and have won prestigious educational awards, including the National Teaching Fellowship. Our involvement in research and enterprise means that our students are taught by leading authorities who deliver the most up-to-date and intellectually challenging curricula. Our academics play leading roles in learned societies and professional bodies, edit leading academic journals and disseminate their research in scholarly conferences around the world. Our staff work extensively with partners in the industry and the local community, ensuring that our work is meeting the needs and challenges of the real world. We arm our students with the talents and resilience for a lifetime of opportunities and success through their can do, will do and go do attitudes to life. The scientific creativity, intellectual rigour and employability skills students acquire with us will open up a broad and exciting range of careers enabling them to make a difference in the world. Students actively contribute to the academic development of our courses, win external prizes and travel bursaries, and to take part in student societies and extra-curricular activities. The School also offers academic awards to recognise excellence and celebrate student achievements. If you see opportunities in all areas of life, keep your eyes open and your mind active, are skilled, confident, creative and disciplined to take advantage of opportunities that come your way, and see the future in the present, you should be here. Come join us to see what it’s all about.